Lenny Kravitz Pitches… The Jeep Wrangler? Not too long ago, Lenny Kravitz was cutting-edge cool. His music spanned the gap between rock, soul, funk and reggae, and Kravitz was a master at being in just the right place at just the right time. Over his career he’s racked up four Grammys (out of seven nominations), a few MTV and VH1 awards, appeared in four films and released eight CDs. He’s touring with U2 this summer, and he’s also working with Chrysler to pitch the Jeep Wrangler. 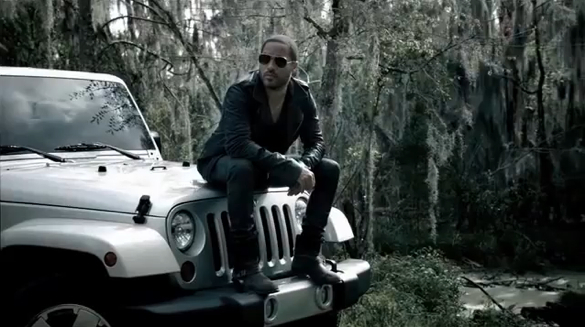 Watch the video starring Kravitz and the Jeep Wrangler below. As odd as it was to see Eminem behind the wheel of a Chrysler 200, I’ve got to admit it’s even stranger to see Kravitz off-roading in a Wrangler Sahara Unlimited. First, there’s his clothes: he may be dressed for a GQ photo shoot, but those boots won’t help much when you have to step out into knee-deep mud to attach a winch cable to your tow hook. Of course Kravitz probably has a staff of assistants to wade through mud for him, but doesn’t that negate the whole off-road-adventure thing? On the other hand, it’s fun to speculate what celebs Chrysler will call on next. I say that we’ll see Lindsay Lohan hawking the Chrysler Town and Country minivan (“Featuring plenty of room to pass out in the back seat”) and perhaps James May, Captain Slow himself, pitching the Challenger 392 (“Even I can go fast in this”).